Even though tumors and pseudotumors are not rheumatic conditions per se, their clinical and/or imaging presentation often resemble those of articular diseases, especially when located within the joints or in nearby areas. Histopathological analysis remains indispensable for a definitive diagnosis, but imaging studies play a fundamental role in the assessment of these lesions. Many musculoskeletal tumors/pseudotumors display a typical appearance on imaging, thus allowing a presumptive diagnosis with a reasonable degree of accuracy. In addition, surgical planning relies on adequate preoperative staging, which can be safely achieved with imaging. 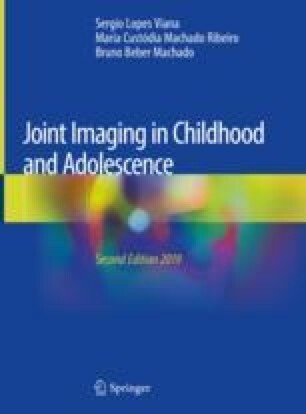 Only selected lesions more prone to simulate rheumatic conditions in the pediatric age group – either from a clinical standpoint or on imaging – are covered in this chapter. Bone lesions include osteoid osteoma, chondroblastoma, cortical desmoids, focal fibrocartilaginous dysplasia, and dysplasia epiphysealis hemimelica, while pigmented villonodular synovitis, localized nodular synovitis, giant cell tumor of the tendon sheath, lipoma arborescens, primary synovial osteochondromatosis, and synovial hemangioma comprise the soft-tissue lesions to be studied. Karami M, Soleimani M, Shiari R. Pigmented villonodular synovitis in pediatric population: review of literature and a case report. Pediatr Rheumatol Online J. 2018; https://doi.org/10.1186/s12969-018-0222-4. Lambert J, Verstraeten T, Mermuys K. Chondroblastoma: an unusual cause of shoulder pain in adolescence. J Belg Soc Radiol. 2016; https://doi.org/10.5334/jbr-btr.1027. Song MH, Yoo WJ, Cho TJ, Chung CY, Park MS, Cheon JE, et al. Clinical and radiological features and skeletal sequelae in childhood intra-/juxta-articular versus extra-articular osteoid osteoma. BMC Musculoskelet Disord. 2015; https://doi.org/10.1186/s12891-015-0456-y. Traore SY, Dumitriu DI, Docquier PL. Intra-articular osteoid osteoma mimicking juvenile arthritis. Case Rep Orthop. 2014; https://doi.org/10.1155/2014/912609.